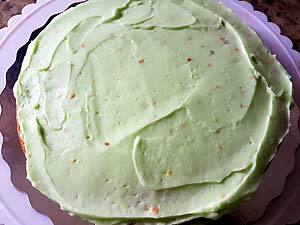 Pistachio Cake: It was my husband’s birthday last week, and I was looking for an easy to bake and yet a fancy cake recipe. He is not a fan of chocolate cakes. I already have a lot of eggless vanilla cake recipes here. He likes this vegan carrot cake, but I didn’t want to lose on an opportunity to bake something new 😉 I don’t know why or how but finally narrowed it down to a pistachio cake recipe. 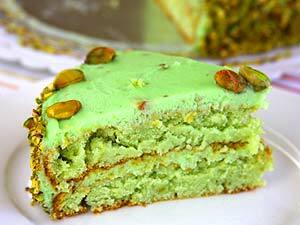 While browsing recipe ideas for the same, I noticed that pistachio pudding cake is quite famous. It looked exotic and elegant. 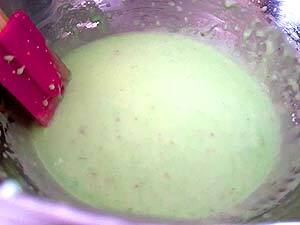 Most of the pistachio cake recipes that I saw, started with a white cake mix and Jello instant pistachio pudding mix was added to it. Whenever I mention the word Jello here, I invariably get a comment that Jello contains gelatin, so it is not vegetarian. To make it clear, Jello pudding mix is vegetarian-friendly. I have double, triple and quadruple checked it and bake these eggless butterscotch pudding cookies at least twice a year. It’s the Jello gelatin dessert which is not suitable for vegetarians and vegans. 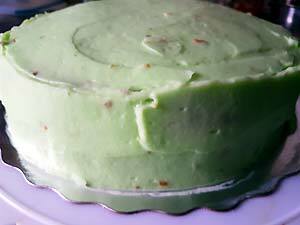 Now that we have got the Jello dilemma out of the way let’s talk more about the pistachio cake recipe. 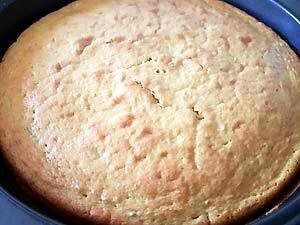 I used this recipe as a base to make my version of eggless pistachio cake with white cake mix. 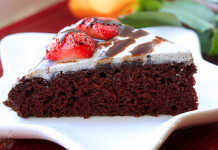 While baking cakes or cupcakes using a cake mix, oil, milk/water and eggs are added. 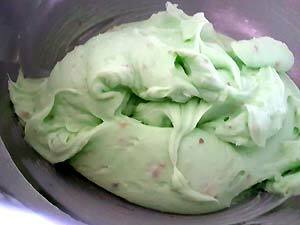 The pistachio pudding cake recipe that I chose didn’t use oil for the fat. I guess that the fat from the eggs and sour cream was good enough. I wasn’t going to use eggs, and I didn’t have sour cream, so I had to come up with a good egg substitute that incorporated some fat content. I used unsweetened applesauce as an egg substitute in this eggless confetti cupcake recipe using a white cake mix. 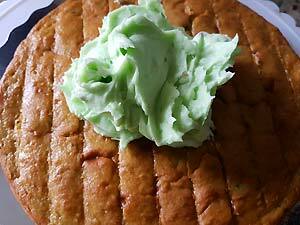 But I wanted to add some fat portion to this pistachio cake recipe, so came up with an idea to use mashed avocado. 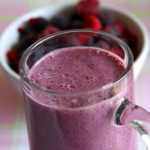 Egg substitute 101 is you can use any pureed fruit as an egg substitute. The green color was a bonus as well! I didn’t have sour cream, used buttermilk instead. I was very close to add chopped pistachios into the cake mix to make it a vibrant pistachio nut cake. But only after mixing the water and the ingredients I noticed small pieces of pistachios already from the pudding mix. So I dropped the idea of adding more pistachios to the cake batter. 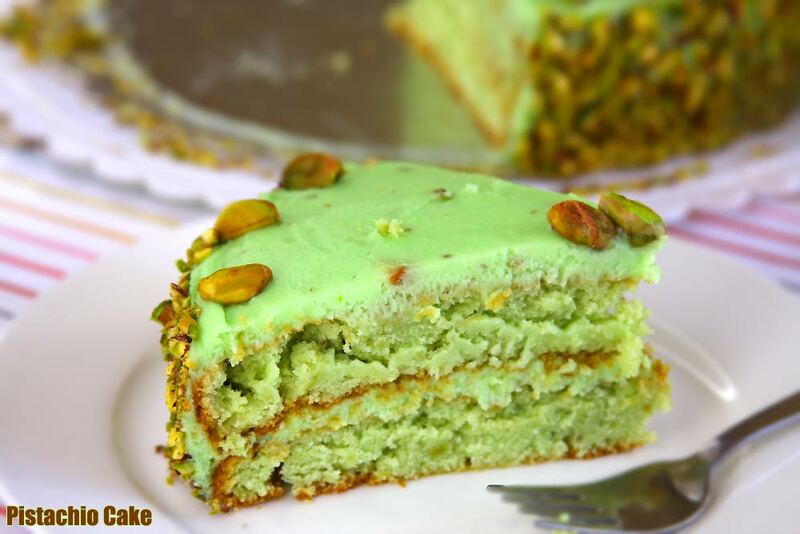 I also came across another interesting information while looking for a recipe to bake this egg free pistachio cake with pudding mix, which is, it is also called the Watergate cake because it takes the name from the popular dish Watergate salad which also uses instant pistachio pudding mix. I was eagerly waiting for the cake to bake, to see how it turns out, to frost with a pistachio frosting and to indulge. It was well worth the excitement and wait because it turned out to be the best and moist pistachio cake recipe, that too without eggs! 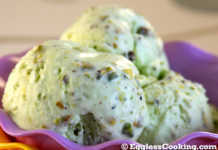 Pistachio is one of our favorite flavors. If it’s yours too, try this, no eggs, easy pistachio cake recipe for your next special occasion. For more dessert pistachio recipes, try this pistachio pudding cookie recipe, eggless pistachio ice cream recipe and much more from the list. 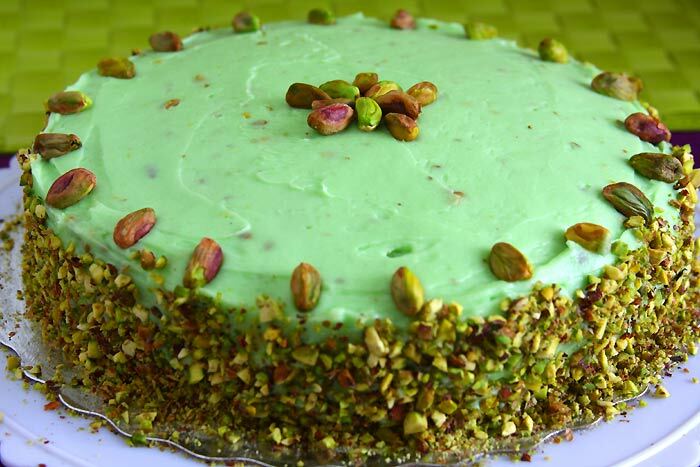 How To Make Eggless Pistachio Cake? 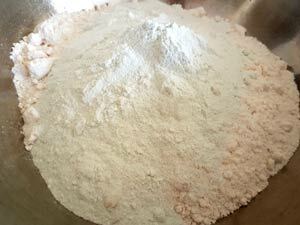 Take cake mix and pudding mix in a bowl. Add water, vanilla and avocado. Line the cake baking pan. Pour cake batter in pans. Bake it for 32-36 mins. Cake is baked and ready for frosting! Add Cream, sugar and pudding mix. Put some frosting on the cake. Put another cake and frost it as well. 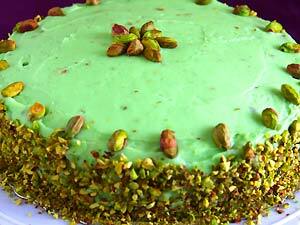 Pistachio Cake after full decoration. 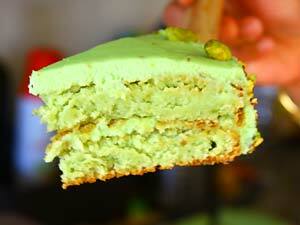 This easy to bake eggless pistachio cake with pudding mix will become a super hit instantly. Try other flavors using different instant pudding mixes. Preheat oven to 350F/180C. 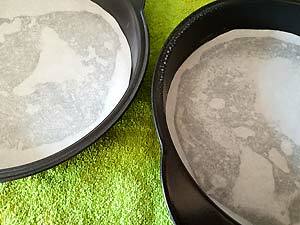 Line two 8-inch pans with parchment paper. 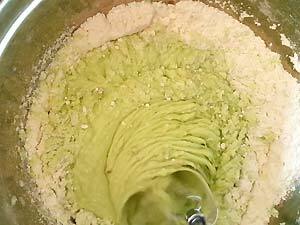 Combine the cake mix and instant pistachio pudding mix in a large bowl. 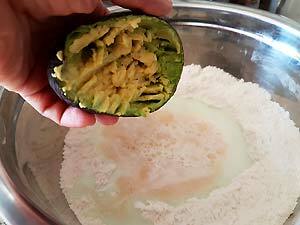 Now add the water, buttermilk, and mashed avocado. 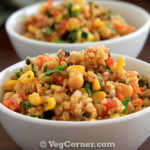 Beat all the ingredients well, using a handheld electric beat or a wooden spoon. 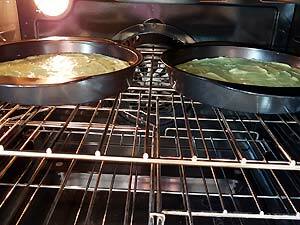 Use a one cup measuring cup to evenly measure out the cake batter into the prepared two pans. Tap the pans to break air bubbles if any. Bake for 32-36 minutes or until an inserted toothpick comes out clean. While the cake is baking, you can start making the frosting. 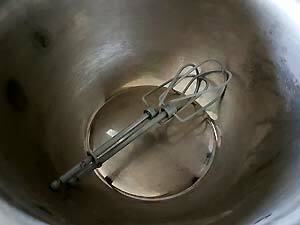 Before even setting out to make the frosting, put a large bowl and the beaters in the freezer. This step ensures to get a good whipped cream frosting. 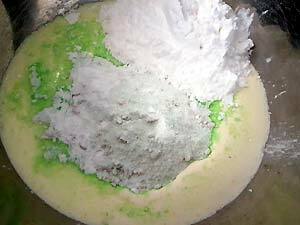 Take the chilled bowl from the freezer and pour the whipping cream, powdered sugar, pistachio pudding mix, and salt. Now whip until you get stiff peaks about 3-5 minutes on the maximum setting. Some blenders have an option for whipping cream. The frosting should be thick and spreadable. If there are domes on the cakes, level it by slicing it off the tops. 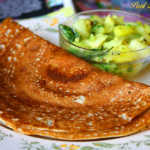 Put the bottom layer of cake on a cake sheet if using or on the plate, you wish to serve it. 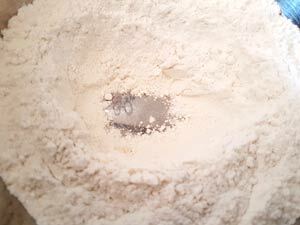 Add about 1 cup of the frosting mixture on top of the cake and spread until even. 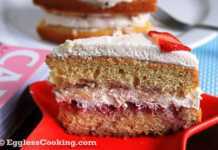 Put the top layer of cake on, and apply the frosting to the top and sides of the cake. For more cake decorating tips and tricks check this page. 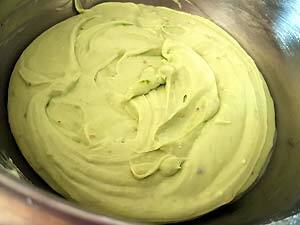 Baking time might be slightly higher for cakes which have pureed fruit like unsweetened applesauce, mashed banana or in this case mashed avocado. So test for doneness using a toothpick. Just don’t remove the pan from the oven once the specified baking time in the recipe is reached. 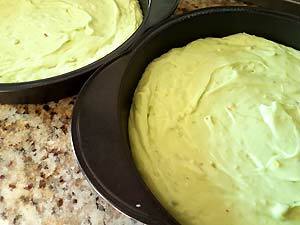 I used two 9-inch round cake pans to make this layered pistachio cake recipe. Only after the cake was baked, I realized that I should have used 8-inch pans instead because the layers were thin and one of the cake slightly cracked which I think was due to the lack of thickness of the cake. 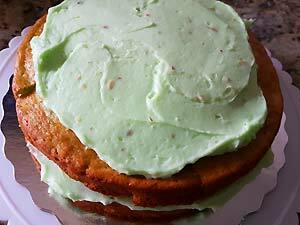 The original recipe had mentioned using 1 cup whipping cream to make the pistachio frosting, but I felt that the quantity of icing won’t be enough to frost the entire cake. So I added another cup of whipping cream and made enough frosting. This quantity was just perfect to frost the whole cake. This looks lovely! Is there something I can use in place of the avocado? My husband can’t eat them. Thank you. I baked this for my daughter ‘s Birthday.The frosting kind of tasted grainy,it’s probably from the pudding mix.Otherwise the cake tasted awesome.Any suggestion on why you think the frosting didn’t turn out right? I don’t remember the frosting being grainy, Jaishree. 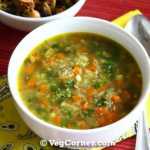 It’s an year now since I posted the recipe, I think. I hope you blended the cream well. Can I use bundt pan for this? If so, how do you think that will affect the baking time? Thanks. I think it will take easily 45-50 minutes to bake. Where do i find instant pistachio pudding mix in india. I’m clueless, sorry. I live in Canada and have never shopped in India for baking ingredients.